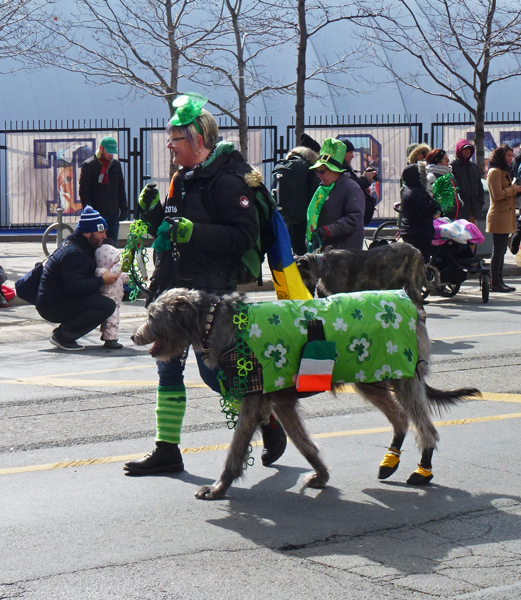 We had our St Patrick's Day Parade last Sunday along Bloor St and one of the highlights for me is always the Irish Wolfhound club that marches a good group of these gentle beasts along the parade. This one in particular had a nice costume don't you think? Um abraço e bom dia de São Patrício. I love dogs, so I would love these "gentle beasts" also. It is a cute costume. I'll be the dogs have fun in the parade, too. Happy St. Pat's day to you, too; which seems most appropriate! Hello Happy St. Patrick's Day. I love the cute dog dressed in green! It looks like an Irish Wolfhound. Thank you so much for linking up and sharing this post. Also, thanks for the nice comment and visit. Happy Saturday, enjoy your weekend! That's a great costume and his "person" looks pretty decked out too! I love that description "gentle beasts". Perfect. A wonderful breed of dog! A nice costume indeed, he is certainly very proud ! The Irish and their dogs know how to have fun. We have several parades around here today. I love it! Makes me smile - Thanks! What a lovely time with those beautiful dogs! Nice event to attend and nice share. Happy Saint Patrick's Day, Pat. ...goofy people do goofy things to their dogs. Great parade! I love those wolfhounds! They are the official mascot dog of the army here. Happy St. Patrick's Day, Pat. Dog? No, that must be a short horse. Lovely outfit. Happy St. Patrick's Day. Great photo! That is one tall pooch. Oh happy day, this is what it should be about! They're having a blast even the pups! I wonder if the pup is embarrassed? :) Fun pic! St. Patrick's Day parades are a hoot, aren't they?